This winter's popular styles of wholesale shoes offered in the website include Suede Boot, Quilted Pumps, Canvas Wedges, and Flats. According to Ceriwholesale, there are many more new styles available from boots to pumps, wedges and flats. These new shoes will provide our customers with the styles consumers are looking for this season. City of Industry, CA October 21, 2007 -- CERIWholesale.com, a distributor of wholesale shoes and other wholesale fashion products, announces this winter's latest styles of shoes. The new shoes, including boots, pumps, and flats also come in a variety of colors, styles and designs. 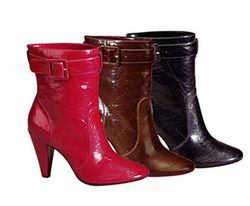 The Hottest colors for women wholesale shoes this winter are black, red, purple and dark natural metallics. Dark red, forest green, royal blue, fuchsia, and golden yellow are also making a comeback, with its rich deep shades. "CERIWholesale's addition of 88-plus shoes in this winter's fashion provides great benefits to wholesale shoe buyers," says CERIWholesale.com . "These new shoes will provide our customers with the styles consumers are looking for this season." All products at CERIWholesale.com come from carefully chosen manufacturers. For wholesale shoes, customers will find that Ceriwholesale's products feature the latest fashion at the best prices. More information about Ceriwholesale.com and its latest winter fashion styles of wholesale shoes can be found online at CERIWholesale.com . CERIWholesale.com is a wholesale distributor of women's shoes, handbags, sunglasses, fashion jewelry, dresses, hats and belt products. CERIWholesale.com establishes strong partnerships with carefully chosen manufacturers. With a direct connection to a variety of manufacturers, the company's products are offered at competitive wholesale prices. New styles of products arrive almost weekly. Convenience and competitive wholesale pricing are some of the best qualities mentioned by CERIWholesale.com customers.